Lions and Snail Shells and Flowers…Oh My! | Shafer...Power! Lions and Snail Shells and Flowers…Oh My! Welcome to our newest series on the blog, Youngpreneurs, where we feature stories about young entrepreneurs from across the U.S. In our first episode we connected with the young superstar, Carter Kostler. In our second episode, things only get better. It turns out Owen and Malia’s classmates already have their own business venture and they’re only seven and four years old, respectively. So after receiving the following email from their mother, Lisa, we couldn’t wait to check it out. I wanted to let you know that Bridget and Charlotte, with a little of my help on the side, teach a 20-minute neighborhood kids’ yoga class on Monday afternoon at 4:30. They charge $1/per kid. Last week they made $5–a bonanza week–but some weeks they only gross $1. I am formally inviting your budding investigative reporters to join us for a free class and they can interview my two miniature ‘small business owners’. 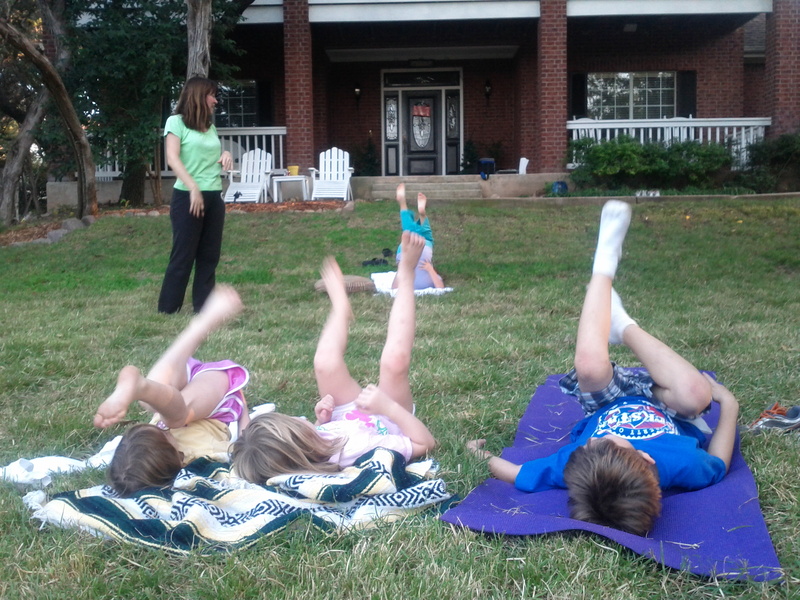 Kids leading kid’s yoga? Count us in! When we showed up to attend a class several weeks later, they already had yoga mats and towels set up for us. Lisa and her girls were in front of the class and they took turns leading a pose. While Lisa did more structured moves – Lion and Tree, for example – the kids did whatever pose seemed to be the most fun at the time. (I believe one of them included running a lap around the yard.) Every child in attendance had the chance to lead a pose and all of them came up with something creative. Some of the more memorable ones included Turtle, Egyptian (think Walk Like an Egyptian) and Flower. There’s no doubt about it, these kids were having a lot of fun. Owen (our 6-year-old son): How did you come up with this idea? Bridget (Lisa’s seven-year-old daughter): We were having yoga at the library and that’s where we came up with the idea. Owen: And so you decided to host yoga at your house…how did you get people to show up? Bridget: Mommy told them about it. At this point, Owen was lured away by a nearby playscape and he galloped away. This left me to finish the interview. Paul (that’s me): Ok, so your mom helped with recruiting…who showed up? Bridget: The first people who showed up were Marie, Jake and Ben. Paul: What did you do at the first yoga class? Bridget: We did yoga moves and cartwheels. I think it’s also when we came up with Snail Shell (a yoga move). And Ben came up with Break the Snail Shell (chuckles all around). Paul: Where did you learn all these different poses? Bridget: Well, some of them we made up and some of them Mommy taught us. Paul: What are some of your favorite yoga poses? Bridget: The Wall, Mermaid and Egyptian pose. Lisa: Did you make them up? Bridget: I made up Wall and Egyptian pose. Paul: What is your favorite pose Charlotte? Charlotte (Lisa’s four-year-old daughter): Flower and Tree. Paul: Is Flower a real pose? Lisa: No…but Tree is a real pose. Paul: Is it true that you’ve been charging for these sessions? Bridget: Yes. It’s good. It’s $1 per person. Paul: Have you been saving the money? Bridget: Yes. I put it in my wallet and I save it. Paul: Do you have a name for your business? Bridget: Bridget, Lisa and Charlotte! Paul: What’s next for BLC, Inc? Bridget: I want to get to 5,000 people. Paul: Could you fit them all in your yard? Bridget: We could put some of them in the house. Paul: Do you have any advice for other young people who might start a yoga practice? Bridget: I’d tell them it’s fun and flexible! Everyone laughs — and ultimately agree it’s a brilliant tagline for the company. Paul: Last question. If you weren’t doing yoga, what business would you have? Bridget: I would have a reading club in my playscape. Paul: Well thank you for sharing BLC, Inc. with us today. At this point, the kids collectively gallop away to their next adventure. It’s good to be a young entrepreneur! I love the “fun” you are having with your kids! Love those kids! Being flexible and creative! I really like how they make it fun for the kids plus they (the kids) earn a few dollars on the side. It’s the right way to do it.